The quest for a homemade soft pretzel began when I was pregnant with Maxwell. As quirky pregnancy appetites go, the image of a specific food – in this case, a soft pretzel – appeared to me one morning and didn’t vanish until the craving was satisfied. I found a recipe from a trusted source. (All hail, Alton Brown.) To accompany the pretzels, I made a cheese sauce of the neon-orange, processed variety. I make no apologies in the name of maternal health. The combination was sublime. Then I had the baby, winter turned into spring, and when summer hit, I longed to grill. But our grill bit the dust this year – RIP. So, pretzel rolls seemed like a good way to dress up a stovetop burger. However, I wasn’t blown away by the first pretzel bun recipe I tried even though it was a recipe specifically for pretzel buns. 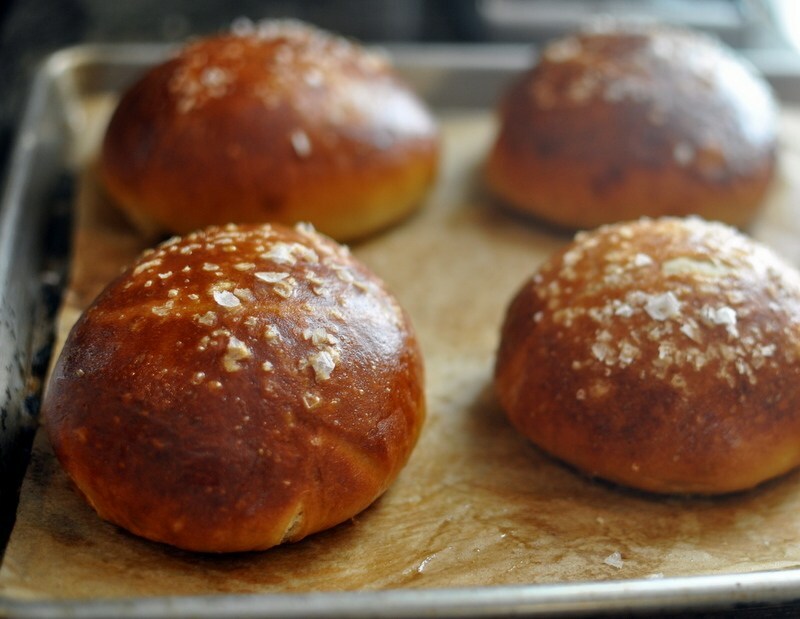 The next time around, I used Brown’s recipe and everyone agreed: the pretzel buns were perfect. No need to experiment further. I don’t think I have to sell these too hard. 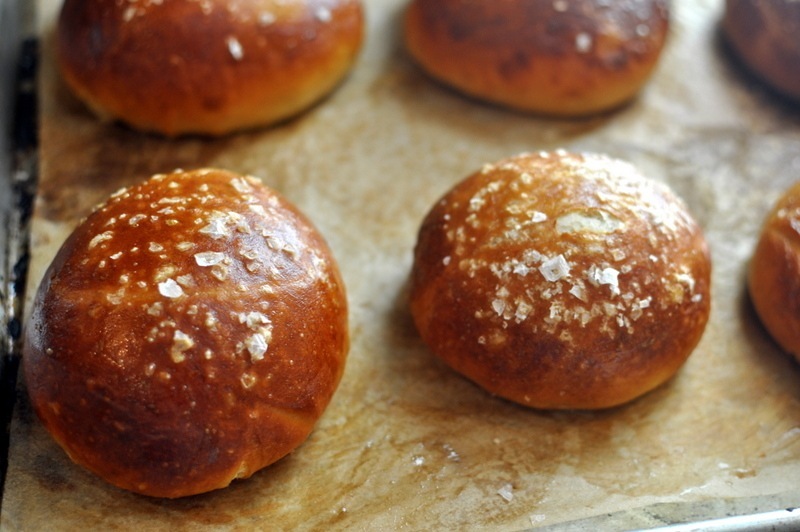 They’re pretzel buns. They’re soft and chewy and salty. With (or even without) a generous swipe of mustard, they will make even the humblest of burgers sing. The buns are best the day they're made, preferably within two hours of baking. I've tried several methods to bring leftover buns back to life on the second day -- re-heating in the oven, toaster, etc. -- but the texture and flavor just isn't the same. In the bowl of a stand mixer, combine the water and sugar. Sprinkle the yeast on top and let sit for 5 minutes or until the mixture begins to foam. With the dough hook attached, add the flour, salt and butter and mix on low until combined. Increase the speed to medium and knead until the dough is smooth and pulls away from the sides of the bowl, approximately 3-4 minutes. Divide the dough into 8 pieces of equal size. Let rest 5 minutes before shaping. Preheat the oven to 450 degrees F. Line 2 pans with parchment paper and lightly brush with the vegetable oil. Set aside. 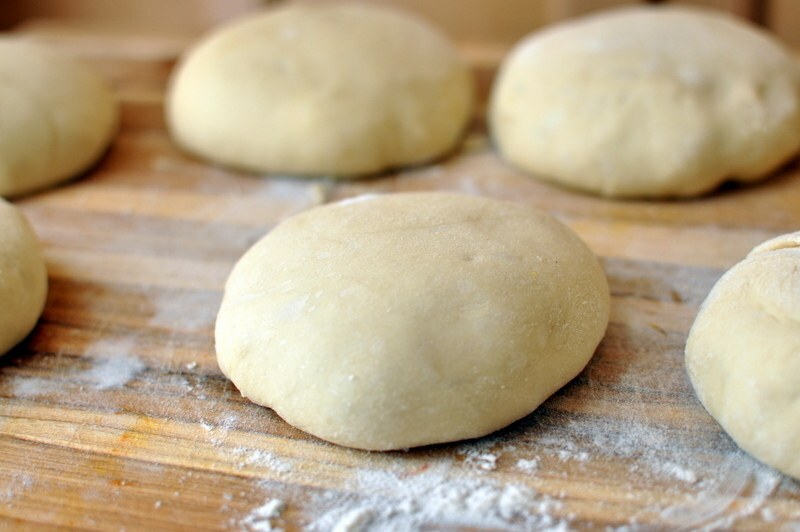 Roll each dough piece gently into a ball, then take each side of the ball and stretch it underneath, tucking and pinching the ends together on the bottom – this gives each bun a smooth, round top. Transfer the formed buns to the parchment-lined pans. 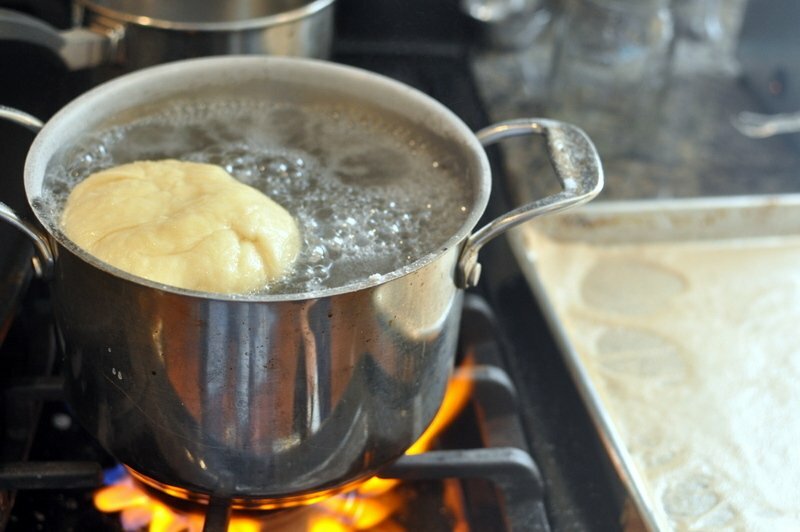 Place each bun in the boiling water, one at a time, for 30 seconds on each side, carefully flipping over with a slotted spoon. With a large flat spatula, transfer them from the water back to the pan. 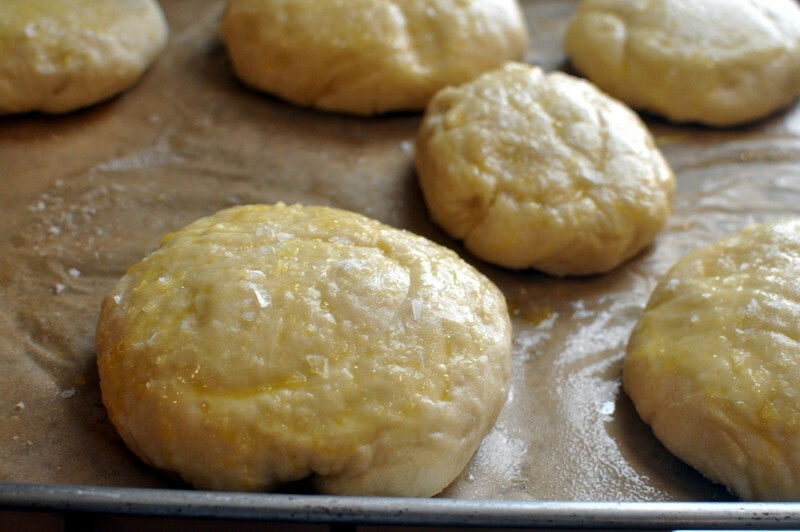 Brush the top of each bun with the yolk-water mixture and sprinkle with pretzel or coarse salt. Bake until dark golden brown, approximately 12 to 14 minutes. Let cool for five minutes before serving. 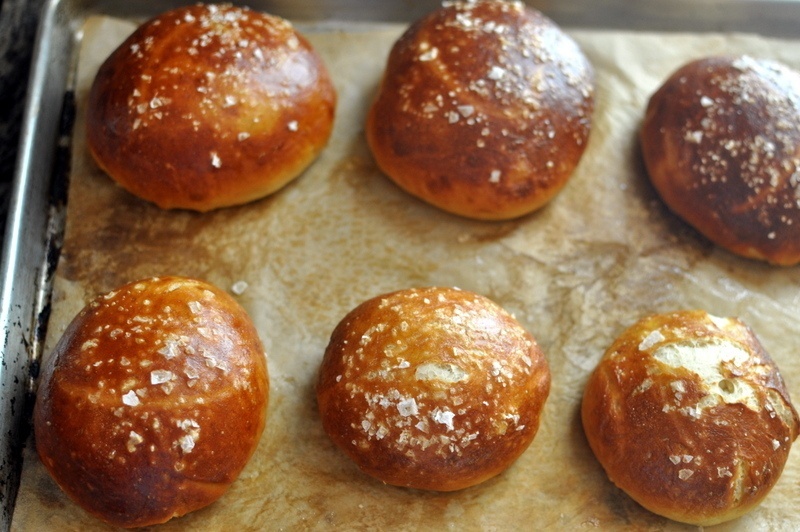 Note: Pretzel buns are best the day they’re made and preferable within two hours of baking.